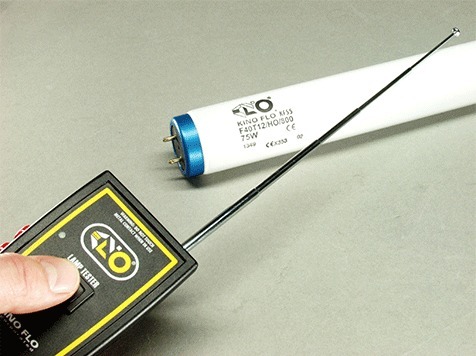 The hand-held Kino Flo® Lamp Tester checks for damaged fluorescent tubes and saves the labor of putting lamps into fixtures for testing. The diagnostic pin sockets confirm that the cathodes are in good working order at both ends of the tube. The telescoping antenna excites the phosphors to ensure that the glass is not cracked and gas has not escaped.